Easy-to-use stopwatch in fun, contemporary colors! 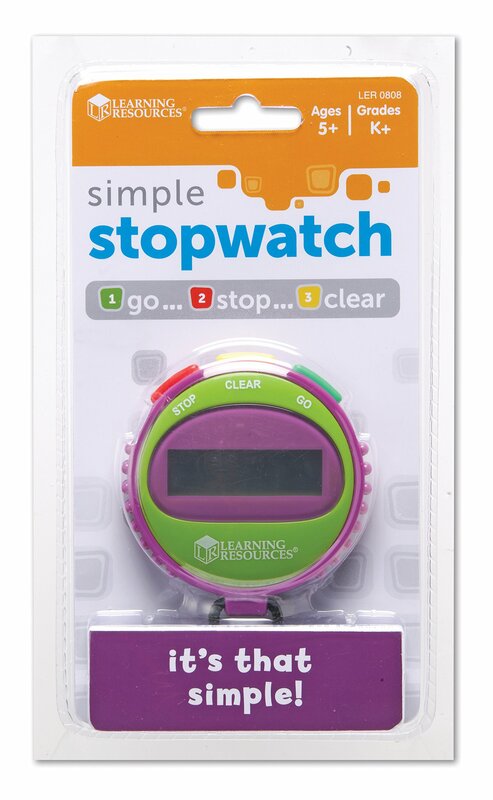 With only 3 buttons--greenfor go, red for stop and yellow for clear--it's the perfect stopwatch forlittle time keepers! Use for exercises, encouraging quick "clean ups", timeouts and more! Easy-to-read display shows minutes, seconds and 1/100 seconds.Measures 3"H. Requires one 1.5 V button-cell battery, included. From the Manufacturer Simple Stopwatch. Even your youngest students can master it. Only 3 buttons--green for go, red for stop and yellow for clear. Great for classroommanagement, centers, timed math exercises, science investigations andmeasuring elapsed time. Easy-to-read display shows minutes, seconds and 1/100seconds. Measures 3"H. Requires one 1.5V button-cell battery, included. GradesK+.